I strongly advocate volatility and beta in a context of general market conditions. So beta in downmarkets is what I am interested in. There are these comps, look at Nemetschek for example which showed a very high beta up til early 2009 although it is a high quality / stable comp. Just one example, but illustrated how fundamental stability can be thrown overboard in the case of smallcaps whenever liquidity dries up. mmi: it is interesting how perception differs. If I have a fundamentally low-volatility company, I actually really like stock vola. This allows me to buy from and sell to freaky mr market more often. I actually see vola as a positive. 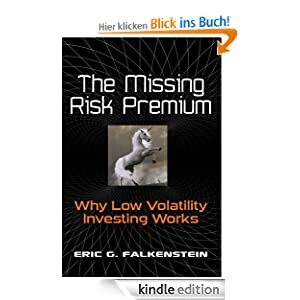 Same for other strategies with a hard-to-explain risk premium, like short near-term vola / long long-term vola, credit basis, writing protective puts etc..
do you have examples for stocks with low fundamental volatility and high price volatility ? Strabgely I don’t know a lot of such companies. I believe you are totally right. But if you are right there is an interesting puzzle: If there is no risk premium, why do stocks better than bonds? In my opinion the main reason is, they do because most investors are restricted to invest in fix-income assets. Similar restrictions exist in the stock market and should create interesting anomalies. E.g. Most non-professional investors restrict themselves to invest in the commonly known stocks. It depends against what you calculate your beta. If you employ risk management your portfolio won’t go up as high as the best index of this year, but you can have lower volatility and lower downside. I was amazed by the non-consequential reasoning Falkenstein applied in his book. He rallies against CAPM but in the end recommends something very similar. In fact, he states that excess return is correlated to low-beta whereas CAPM says excess return is caused by high beta. This is not all so different like he wants us to believe. It is just that CAPM as empirical fact on its side before 1970 and Falkenstein on his side after 1970. The “official” finance explaination (institutionals trade after information ratio and not return) at least to me does not intrinsically explain the “low-beta alpha”, does it? Whenever I read you (no offense!) write about “stock XYZ also has a low beta which is good” I happen to shiver. I just don’t get it! What is the past reaction of investors in a given stock relative to market moves telling me about their future reaction? What about empirical fact about correlations going up during time of short liquidity / rising risk premia? Why should a given stock be exempt from this if it was in the past? However in my experience, most investors hate low beta stocks because you underperform quite significantly when stocks go up. I buy this part of Falkensteins argument, that high beta stocks most of the time trade at a premium (lottery ticket) whereas low beta stocks most of the time trade at a discount. After a crash, this is mostly not true. So what I am aiming is are stocks with low fundamental volatility, if they show low historical price volatility, it is “good” but I would also buy a cheap stock with low fundamental volatility and high price volatility. Howver I have to confess that high price volatility sometimes makes me nervous….